Thanks to Whoever Sent This! Here at the Hamilton House we’re celebrating the recent birth of a little one, and someone sent us a fitting onesie–fitting, that is, for our family, even though the little baby doesn’t fit in it quite yet. He’ll grow into it! We don’t know who sent this to us, but we want to thank whoever it was! If you are the giver of this great gift, please do let us know so we can express our enthusiastic appreciation to you more directly. 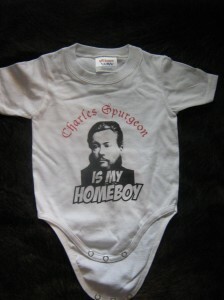 This is a fitting gift for us because we love Charles Spurgeon, and we consider him one of our forefathers in the faith. In fact, soon after I was accepted into the Ph.D. program at The Southern Baptist Theological Seminary, we got a dog and named him Spurgeon. It seemed like an appropriate way to celebrate our return to Baptist life. Both my wife and I had grown up in Baptist churches, but during our time at Dallas Theological Seminary we were involved mainly at Northwest Bible Church in Dallas. One of the major factors that brought us back to Baptist life was the encouraging news coming from Southern Seminary, where Dr. Mohler has led a great return to the faith. How we pray that our children will grow up to love Jesus, the Savior their homeboy, Charles Spurgeon, so faithfully preached! 6 Responses to Thanks to Whoever Sent This!